Thanksgiving will be celebrated this Monday. If you are the traditional type, you probably enjoy a good meal with a nice turkey and cranberries. So here is a menu specially designed for this occasion. While respecting tradition, it is well suited to families today that are less numerous than before, and to the modern trend of spending less time in the kitchen. 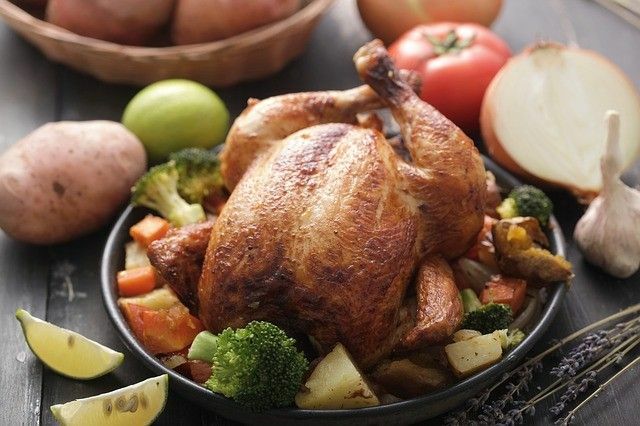 Turkey is a smart choice from the financial as well as from the nutritional point of view. And since turkey protein is rarely allergenic, it is most likely that all your guests will be happy! Read our blog post on How to Cook the Perfect Turkey in a Few Simple Steps. This soup is a seasonal essential. Leek adds a particularly autumnal flavour. You can even use pumpkin seeds to garnish. If you’re worried about making too much, know that it keeps up to 4 months in the freezer. Enjoy! This member of the cruciferous family is the leader of cancer preventing vegetables and is also an excellent source of vitamins. It acts as a very good accompaniment to many dishes. However, it is often disliked because of its bitter taste and mushiness when overcooked; to avoid this, just sauté it till it becomes «al dente», so that it retains its green colour and crunchy texture. An apple, pear, and cranberry tart. Originally published in the Journal de Montréal on October 6, 2012.